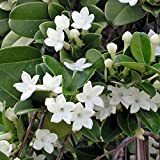 Stephanotis floribunda growing climber of the genus Stephanotis also known as Madagascar jasmine, Stephanotis floribunda perennial evergreen used as ornamental fragrant plant, can grow in tropics, mediterranean, subtropics climate and growing in hardiness zone 10+. 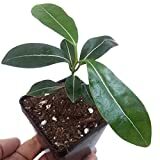 Leaves color green in oval with pointed top waxy. Flower fragrant color white glossy waxy with five petals the flower grows in clusters.